Joel Cole, owner, Joel Cole Construction LLC. 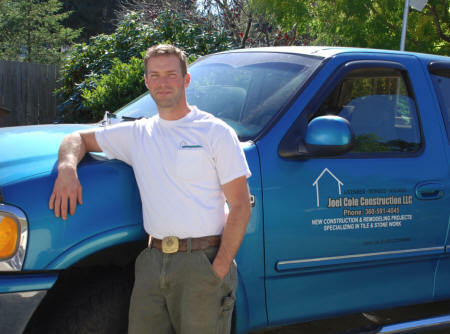 Joel Cole Construction LLC is a residential and commercial construction company, located in Aberdeen, WA. Established in 2010, we serve the Grays Harbor community and outlying areas. Joel has over 20 years of experience in the construction business. If you are looking to build a new home or expand upon your current home or business, we can help you! Look no further than the construction specialists at Joel Cole Construction LLC to help you with your project. Our customers feel confident doing business with us because we offer an iron-clad guarantee of solid customer satisfaction. Call 360-637-9257 for details! Our guarantee is based on your project budget, and we will do everything possible to make the project come out on time and on budget with attention to detail, craftsmanship and top quality materials. "2012 Talk of The Town" business in Aberdeen, WA. The Talk Of The Town award is based upon ratings calculated from consumer-reviews websites, blogs and social networks, business rating services and other information to determine the top companies across the country. Only those high ranking businesses with a 4-5 star rating win the talk of the town news customer satisfaction award. Whether you’re looking to remodel every room in your home or you are starting from scratch, Joel Cole Construction LLC is here to help you turn your dream home into a reality. Customer satisfaction is our top priority and ultimate goal. If you aren’t happy, we won’t be happy either. When you work with Joel Cole Construction LLC, you can be sure that you’ll receive top quality craftsmanship with attention paid to detail and time constraints. At Joel Cole Construction LLC, we’re here to help you from the foundation to the final brushstroke. In addition, we can help you around the house with everyday repairs. 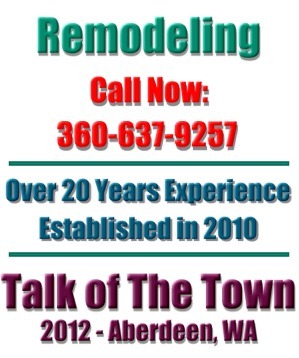 Our handyman expertise is also popular among residents in Aberdeen, WA. When you want the best quality work at an affordable price, you want Joel Cole Construction LLC! We are licensed, bonded and insured for your peace of mind. We are professionals and it shows. for more information, or a quote!